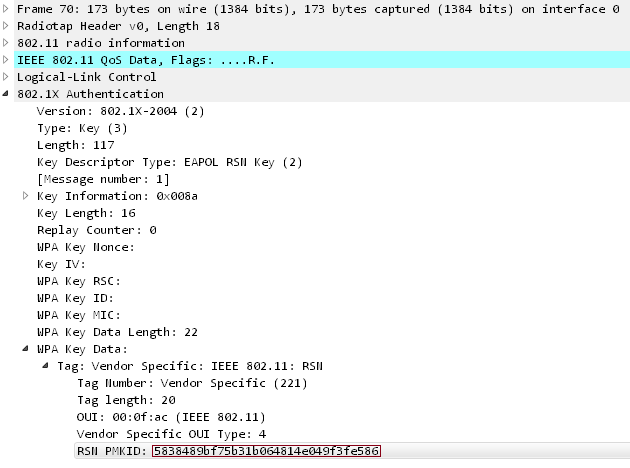 There's also support for hash-mode 16801, which allows skipping the computation of the PMK - which is the computation that makes cracking WPA so slow. Pre-computing PMK can be useful in cases where you are on site and you cannot transfer a hash to a remote cracking rig because of an NDA. The goal is to run hashcat on your notebook which you can bring to the site. Exciting! Where are these routers located, businesses or homes? When trying to target a specific AP (making sure I only hit mine, not my neighbors), I'm trying to use --filtermode=2 and --filterlist=filter.txt. filter.txt consists of a single line containing my AP's address in the form "05D2BA2B8CD". This consistently returns segmentation fault. Remove just the --filterlist and everything appears to work fine, though I'm not sure how filtermode=2 works with no list, but it runs. I've tried several variants (e.g. --filterlist ./filter.txt, full path, etc.) with the same results. Am I using these flags correctly? That is, both in the intended manner (to target a specific AP) and not doing something stupid with the syntax to create a segfault? Trying it out now against Ubiquity gear and it doesn't seem to work. I'm not sure yet if this is my fault, or if Ubiquity isn't vulnerable, or if my AP settings just don't allow this (not roaming). Working on setting up a wireless lab next to try out a few older all-in-one router/AP's. Edit: No issues capturing PMKID from an old Netgear WNR1000v3 I had laying around. Still not getting anything from the Ubiquity. Thanks again for the work you guys do! Thanks for reporting this issue. I fixed it with the last commit. We tried to use filterlist entries on the first outgoing broadcast packet. Since there are no incomming packets at this moment, we run into a seg fault. Great work and thank you to all those involved! I just registered to congrats you for this excellent discovery and to thank you for sharing it with the entire community in this "open source & full disclosure" spirit. I was pretty depressed to end my vacacions, but now i am pretty exited to come back to dig into that. Some VENDORs change the chipset, but keep the same product name. Make sure, that a supported chipset is inside! Signed up just to say thanks as this will be a great tool/method for my lab exercises. Just some feedback - I messed around all day with a T2U Tp-link adapter until I realized it wasn't working correctly. Once I booted up my laptop with The-Distribution-Which-Does-Not-Handle-OpenCL-Well (Kali) and used the internal NIC I was able to see the probes/responses etc. I was able to get the PMKID from a Linksys E2500 v3 running TomatoUSB. Ran hashcat against it and got the 12345678 password. I still have a Netgear wnr834B running dd-wrt to test (can also test factory firmware) and a newer Linksys EA8300 to test. Just curious - can you somehow run a word list against the PMKID? (08-06-2018, 01:43 PM)awdmesh Wrote: Just curious - can you somehow run a word list against the PMKID? hashcat usage for this hash mode is the same as for every other mode. From what it seems, this is going to be huge! The question I think a lot people will ask: Is this attack viable (future) on non-PSK networks? I tried at my own (radius/wpa-enterprise) network, just to check, and as expected it failed miserably.